Faux fur is still on trend and is becoming a universal layering piece. People are layering faux fur over pretty much any look - including dresses. Here are two styled looks I put together with dresses. 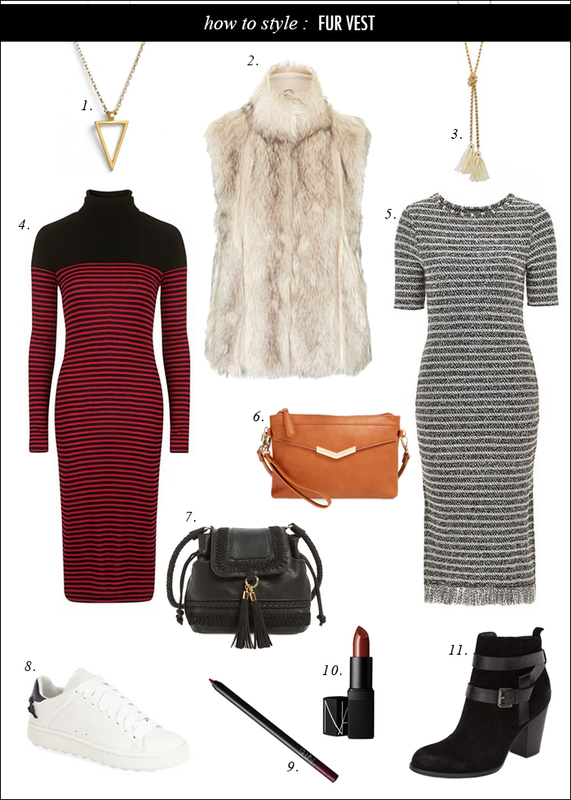 I really like the striped red/black dress, which could easily be worn with riding boots or tall OTK boots (a budget-friendly option that looks just like Stuart Weitzman boots but are a fourth of the price, plus they are $30 off today). "A positive attitude enables you to make the best of every situation, and that gives you power over your circumstances instead of allowing your circumstances to have power over you. Make a commitment today to be a positive person. The more positive you are, the more powerful you’ll be." This is from the book I am reading. I love the fringe on that dress! You should be a personal shopper. Have a great weekend! Yes! I finally know how to style a fur vest I've been wanting one but don't know how to simply put an outfit together thank you thank you !! I love your style!I love fur vests and fringe handbags and dresses. I love your styling! Both those dresses are absolutely gorgeous. Love the vest!! Awesome post. Emperia bag is the best bag ever! What a gorgeous piece! My friends laughed at my last year when I bought my fur vest...now I wish I had two.